In this edition of Knyzka Corner, we will be discussing Vasyl Shkliar’s novel, Raven’s Way. 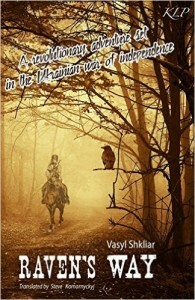 The events of the novel are told by multiple narrators describing the steadfast resistance of the forest soldiers led by new Otaman Raven against the Russian occupiers of Ukraine. Their battle rages for several years with impressive victories against the Russians, as well as crushing defeats. Intertwined into the narrative is the poignant story of Veremii’s wife Hannusia, who gives birth to a son after the death of her husband. She continues to hope that he is alive even when she is tormented by Russians. Their extreme cruelty is shown when they force her to jump off a cliff with her child. Miraculously, the child survives and is taken to safety by Raven. Ultimately, the child becomes a part of the love story involving Raven and his girlfriend Tina. Shkliar is a skillful writer who weaves in Russian documents about brave Ukrainian resistance fighters into his narrative. There are frequent references to actual historical figures such as Shymon Petliura, Taras Shevchenko, and Stalin. The writer’s descriptions are at times brutal and gruesome, but at other times, they are evocative and lyrical. The comparison to today’s political situation in Ukraine is unavoidable. Readers will definitely be able to compare current news stories about brave Ukrainian soldiers fighting in Eastern Ukraine to the exploits of Raven and his men in the forests of Kholodnyi Yar. North American readers may find Raven’s Way challenging to read at first. There are dozens of characters with similar sounding names. The narrative structure is complicated by numerous narrators including Raven the warrior and Raven the bird. There is a useful glossary at the end of the novel; however, it could have been expanded for North American readers to clarify variations in terminology such as the interchangeable use of “Otaman” and “Ataman.” However, the power of the narrative will soon win readers over with its exciting storyline and dynamic characterization. Raven’s Way is available at Chapters/Indigo and Amazon. Kalyna Language Press Limited, 2015. 411 p.
If you click on this link to take you to Amazon, your purchase could generate a (very small) commission for Nash Holos — without any cost to you. Instead, you will get a large multinational corporation to share a bit of its profits and help keep Nash Holos on the air for your listening enjoyment. Thank you for listening, and for your support!